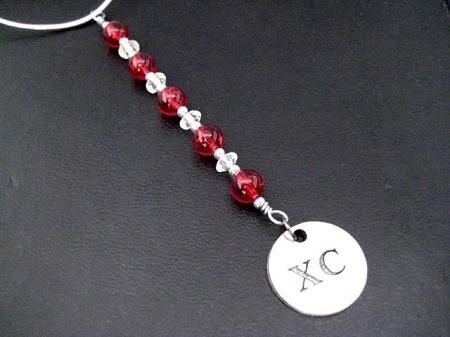 The Run Home's XC Round Pewter Pendant is available only at The Run Home! The Run Home's Icicle Ornament makes a unique gift! Use is as an Ornament, Gift Tag, Wall Hanging or Rear View Mirror Bling! The Run Home's Icicle Ornament / Gift Tag / Bag Tag measures approximately 4 inches long and is handcrafted out of vintage beads featuring a main bead color of your choice plus vintage clear and silver beads. The Run Home's Exclusive XC Round Pewter Pendant measures 3/4 inch Round and dangles from the bottom.